It take’s a very good product for me to label as my most favourite. 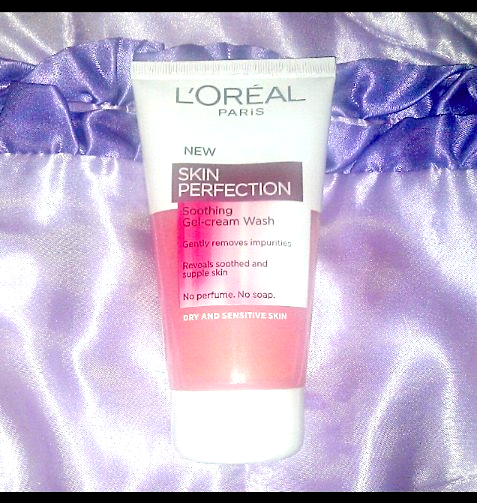 And the L’Oreal Skin Perfection range’s gel-cream wash is definitely currently my favourite face wash. I say currently but I’ve actually been using this particular product for a few months now, and I am very happy with it. I’ve tried out quite a few face washes’ and scrubs, and I’ve found that the L’Oreal skin perfection face wash works best for me because I have rather sensitive skin. My skin like many young women is at times a little prone to spots and blackheads. I’m guessing that most probably the reason for this is that I have quite oily skin. However at times it can have some dry patches on my face, particularly nose and around the mouth area. So I’d say I have combination skin. The L’Oreal skin perfection gel-wash claims to be for dry and sensitive skin. I use this face wash every morning and before I go to bed, unlike some other face washes, this product isn’t harsh on my sensitive skin. Instead it’s very gentle, and I always find that any spots or imperfections I have tend to vanish after using the L’Oreal skin perfection gel-wash. I’d say this takes around two washes. And this is great! I find that some face washes and particularly face scrubs, cause me to have a negative reaction. This often leads to more spots then I’d usually have, as well as even more sensitive skin. I think that the L’Oreal Skin Perfection range is great for young women. Their product’s are also very diverse, in that there’s literally something for almost anyone. There are actually quite a vast amount of different product available in the Skin Perfection range. I myself haven’t tried and tested out all of them. I’m a little tempted to trying out the Skin Perfection Purifying Gel Wash for normal to combination skin, as well as the Radiance Revealing Exfoliator. I’m expecting that unlike other exfoliators I have tried, it won’t have the same harsh effect. However what I’ve currently discovered is that by adding around a tea spoon of bicarbonate soda to my face wash, it transforms into a great DIY exfoliator, which isn’t harsh on my skin. I would do this around 1- 2 times a week. And I have noticed great results (spot redness goes down or disappears significantly!). I find that the L’Oreal skin perfection gel-wash is great value for money – another positive. I tend to purchase the product from Superdrug where they usually have a two for £5 offer. Great for students, and those looking to save money, as beauty products seem to be getting even more expensive lately. You can also purchase the wash from many high street stores and supermarkets. As a final note, this is my personal opinion on the product, and I hope it has helped.